blacksmith shop to find the church and save who you can. Perhaps I can tell you more if we speak again. Good luck. Slay the evil lurking below the church. Buy, sell, repair and recharge Items in the Village called Tristram. Find awesome Items and gain Experience. Increase your Strength, Dexterity, Magic and Vitality. Play alone or together with up to 3 friends. Read books to learn new spells and improve already learned ones. 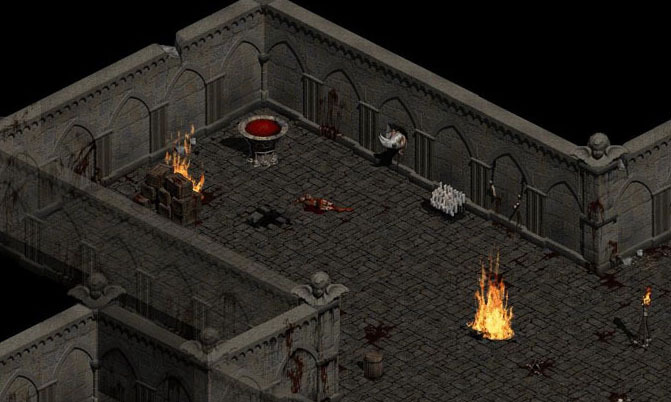 Enjoy the quests, music and story from Blizzard's Diablo 1. Use QWERT as mouse button spell switching hotkeys. Hold shift to force bow shots, spell casts or scanning for an enemy in mouse pointer direction in front of you to swing your melee weapon into. Every game is different due to a randomly generated dungeon and a random selection of quests. Improve your gear with Crafting items like magic stones and oils. Try to gamble better gear at Wirt for two or three handfuls of gold pieces. Find books of magic to learn some arcane spells. Can you learn all 17 spells? Use gems to improve socketed items. Griswold will be able to safely unsocket the gems for a few coins. He can also combine gems of the same type. Bash your friends in Farnham's Cellar. Talk to him to enter. prefixes and suffixes are slightly more free than in the original Diablo titles. For example, helmets can provide you with life steal. 6 Potion types to ensure your survival and your mana requirements. Repair your Items before they break. Every Item has its own Durability which can be decreased during a fight. Items that are require a repair are displayed on the screen. Stash your items at Gillian, if you want to keep items that you don't carry at your body. The Scroll of Town portal creates you and your friends a fast and safe travel back to Tristram to sell, heal and repair. After that you can directly jump back into action. Other Heroes if they join Farnham's Cellar. -monster archers shot arrows on targets they can see and that don't have a Wall in the way. - feedback is welcome... what is too strong? what is too weak? what is buggy? what could be better? what would you like to see in the game? Note that these screenshots might be outdated and due to problem with the host of SEN (sql server goes away), I can't add more pictures in here. So feel free and browse the last pages of this thread to find more recent ones. Click me as this video of TotalBuiscuit contains multiple maps. If you find a bug, make a SCREENSHOT and try to write down some info about what happened and what could have caused that in your opinion and everything that might be important or related to that bug, please, and let me know about that bug. I enabled replays now, so providing me with the replay will help me greatly, too. just give me bugs with as much details as you can to help me understand the source of the problem... replay/screenshots are super helpful for that. Concept of my mouse UI in sc2. A few words about my randomized dungeons. I am Ahli.634 on Americas and Europe (mostly Americas). Post has been edited 127 time(s), last time on Jan 22 2016, 5:47 pm by Ahli. This looks incredible! I'll help test if you want. Also, I hope this doesn't break any of Blizzard's rules considering how much time you've put into this. Thirdly, it looks Awesome.. but question is, is it worth it??? Wouldn't it be better to innovate? Of course I'm breaking a rule with that because I'm using their content. But anyway, the map is property of Blizzard (in sc2 eula). Unless someone stops me, I will continue. Due to the map space limit, the talk sounds won't be inside. Same goes to many monster sounds, maybe. But atm I'm building everything up to support some sort of offline version that could contain everything. So I will never reach the perfection of an original product. And still, only the graphical content, dialogs, names and other copied/rebuild content could be replaced with new content more or less easily. Anyway, Diablo 1 is super old and Diablo 3 is on its way. Blizzard stopped patching it a long time ago and never fixed all devastating bugs (dupes). I'm planning to change and improve the game like I've already changed some data. And the name won't be "Diablo 1". I need another one. Interestingly I've like 0 fps loss, if I'm playing that map on bnet... superstrange! Unfortunately the missing GUI bug is happening on bnet, too. So sometimes you can't see the normal GUI after hero creation/loading and can't create hotkeys... just regame then, pls. Post has been edited 3 time(s), last time on Feb 10 2011, 2:46 am by Ahli. Not sure if I understood: can I be tester as NA? Also, because of the point of view, we some times miss the entry on some of the dungeon levels. Oh, and I want a "Repair All" button. And walking away from a char should remove all dialogs. And to interact with a char, right clicking on it should work as well. Ahli is on EU - like me. So I'm pretty sure (unless he will allow someone else on NA to publish it) that you won't be able to play it online. I've helped test it a few times - needs some polish but the progress is really good, keep at it Ahli! Blizzard don't care about EU - and if this gets noticed, he'l only get more attention for it . And as he stated, this map is property of Blizzard due to the EULA, and anyone who plays Starcraft 2 - or has any clue about Blizzard - will know that Diablo 1 was a Blizzard game to begin with. In my opinion, it's just fan-created praise to a Blizzard classic. It looks Awesome.. but question is, is it worth it??? Wouldn't it be better to innovate? This is the only problem I have... I hope Ahli will put in some new spell tree's, talents etc - maybe new hero classes too. Even more and different quests and monster types. But the Diablo 1 system he has so far is great! SENners can publish it privately on US to play it together (e.g. in map night). I'm really thinking about that because the Warrior didn't rely on the skills except teleport. But I love the random book findings. So I may will have 2 systems. Some arcane magic bolstered through books found inside the labyrinth and some class based spells/abilities. This also opens new possibilities of a support unit like some sort of Paladin (I think it's the paladin in every new game who does that). - finding books for arcaine magic will be inside in some future version. - new useful abilities for melee players would be cool, ideas are welcomed. Hit recovery stuns + bow attack time are visualized with the timer bar appearing. You can only go into hit recovery, if the damage is bigger than your clvl. If the received damage is bigger than 12.5% of your current life, you will go into hit recovery. If it is lower, you have 50% chance to go into hit recovery. You can't see the difference between the 4 subtypes of a monster class right now. e.g. : A unit named Zombie has the stats of one of the subclasses which are Zombie, Ghoul, Rotting Carcass, Black Death. Zombies can appear in dlvl (dungeon level) 1-2, Ghouls in 2-3, Rotting Carcass in 2-4, Black Death in 3-5. They have different CtH, mlvl, life ranges, AC (armor class), damage, resistances and give a different amount of experience. Post has been edited 1 time(s), last time on Feb 13 2011, 12:07 am by Ahli. I don't see what the World of Starcraft thing has to do with anything. Blizzard is fine with that map being made, as they've said multiple times. They liked the idea enough to fly the mapmaker out to Blizzard's HQ in Irvine. Either way there's a whole topic for that in the SC2 General forum, I don't mean to beat a dead horse. When I asked about breaking the rules, I mainly meant about recreating an existing game in SC2. Because its a Blizzard game, they may have less of an issue with it (though I've read elsewhere that they aren't too keen on importing models from other Blizzard games yet, but that may change). It's possible that you can't permanently enter a dungeon level because of a chest in the way where your hero should be moved to and the displacement sends you into the area that takes you back to the level above. Monsters can block it, too, but all monsters will wander around so the block should be temporary. I plan to make the dungeon entrances/exits with right clicks somehow (somehow with ability on stuff). But I'm currently adding a check for diagonal places for dungeon objects in the random dungeon generation system. I've fixed the non showing UI bug (you have to come back to the main menu to activate it). Hiding it multiple times makes the ui not appear with one "show". I've added a diagonal stairs check while dungeon creation. fixed some bugs and made the loading a little bit faster. Post has been edited 3 time(s), last time on Feb 13 2011, 1:01 am by Ahli. Tested with 4 players your localized version. - Hold Position should have a Potion icon and be placed somewhere in the bottom line. It should also -not- stop the attack of players. - A 'b' or 'i' hotkey for the inventory pl0x? - Some of the players seemed to be confused about the interaction with NPCs. Right-clicking a NPC should make you interact with him. - Attach Text Tags on NPCs. Informations like "Healer" or "Blacksmith" would be the best. Forget about their names for the Text Tags. - Make NPCs wander a round a bit? - Add a "Repair All" option pl0x. - Using "Alt" to show items' names wouldn't work 100% of the times. Don't know why and in which particular situations. - Letting the players move their hero while talking to a NPC would be great: as soon as it moves while a dialog is opened, close the dialogs. - Make the "Stats" button flash when we level up? We were all Warriors. Was I right to tell them the 2 other classes weren't functional? I'm using the grid, so I've nothing on H by default. yes, I should do those. The game still has to be able to be played with lowest resolution. need a wall model anyways or something like that. But I don't know how I could make it less shine. It shows only the names of items in an area around the hero. I didn't make the area to big. May cause to much lag depending how I implement it. I've mainly disabled it to prevent bugs with item buying and selling because I have to use orders to efficiently transfer items into the inventory or out of it. You can hit ESC to close dialogs, too. Warrior and Rogue are playable. First level may be super easy for Rogues since the units have low HP and bows do normal damage (monster type doesn't effect the damage). You can play Sorcerer, too. But there are no spells. You would just have a much harder time to survive. You can shoot arrows with the 4. mouse button (first side button). Image of 4th mouse button please. I'll throw up a wall model once I install max. You'll have to show me a picture of how dirty and oldschool you want the wall though. "In short, their absurdities are so extreme that it is painful even to quote them." My mouse doesn't have 4 mouse buttons. Make mouse3 the default, please, essentially everyone has one of those. Maybe something into that direction. A grey square would do it, too. My Razer Deathadder has button 4 and 5 reversed in relation to that pic. My 4th button is the front side button clickable by the thump. And it's even worse for Mac users. You should just make it "Left-Click on enemy while Bow is equipped"
Or Shift+Mouse1 . Like it was in Diablo? It isn't textured yet and there's a couple more things to do. It's 152 polies, which is pretty low, but I'll increase the pillar quality so it looks better, which will put it up a bit. Better render for showing how the pillars aren't that great quality. Post has been edited 1 time(s), last time on Feb 14 2011, 9:39 pm by Jack.